This charger is a universal LiIon and NiMH charger. 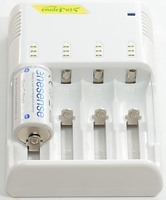 It can be switched between two different LiIon voltages, making it possible to charger nearly all types of LiIon batteries. It comes in a cardboard box with a window and some unreadable (for me) specifications. Included in the box is the charger, a mains cable (US), a car cable and a instruction sheet (Again unreadable for me). 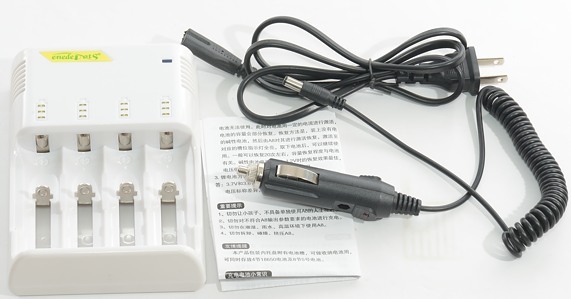 The charger has mains input with universal voltage (100-240VAC 50/60Hz) and DC input (12VDC). 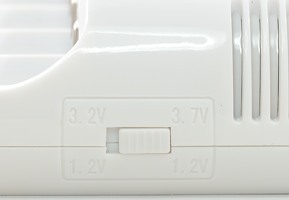 The charger has a switch, that can be used to select LiIon charge voltage. This makes it possible to charger more chemistries, but remember to select the correct position before charging! Note: The switch is active during charging, i.e. changing the switch will change the charge voltage immediatly, but the charger will not restart if the charge is already finished. 1 flashing, 1 steady + 1 flashing, 2 steady + 1 flashing: Charging, number of leds is a rough guide to actual charge level. 3 steady: Battery is full. 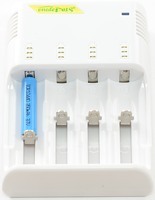 The charger also has a blue led to show "power connected". The cradles in the charger can easily handle from 16340 to 18700 size, both flat and button top batteries, but the slider do not slide smooth. When pressing at the top of the slider it is often difficult to move and it can lock. 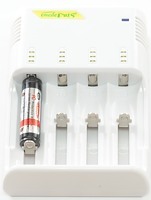 The charger can handle 70 mm long batteries, including flat top cells. 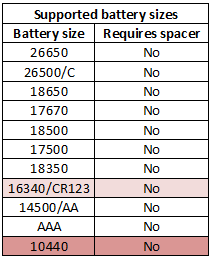 (See my 18650 LiIon comparison for length of different brands). With 26650/26500/C cells the charger can only handle two at a time. 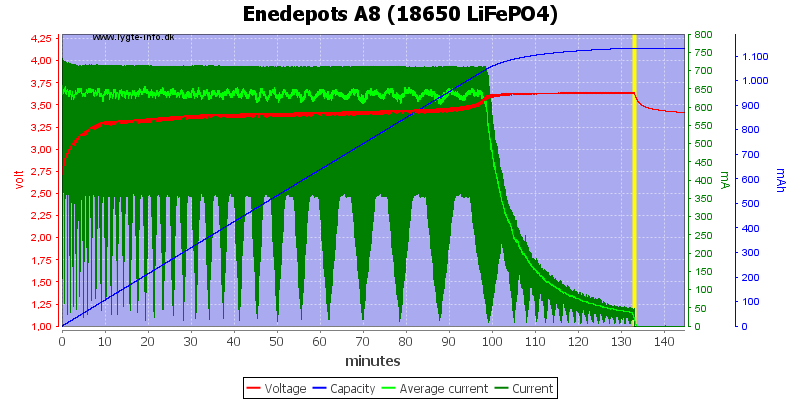 With 16340 and 10440 LiIon cells the charge current is too high, with 16340 it is not that much, but I would not recomment to charge 10440 in the charger. 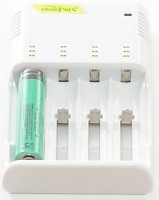 Charging two batteries in the linked slots will reduce the charge current to a better level. The charger has two charger channels, one channel is handling slot #1 and #3, the other channel is handling slot #2 and #4. When charging cells in both slots for a channel, time division is used to distribute the charge (See scope traces). 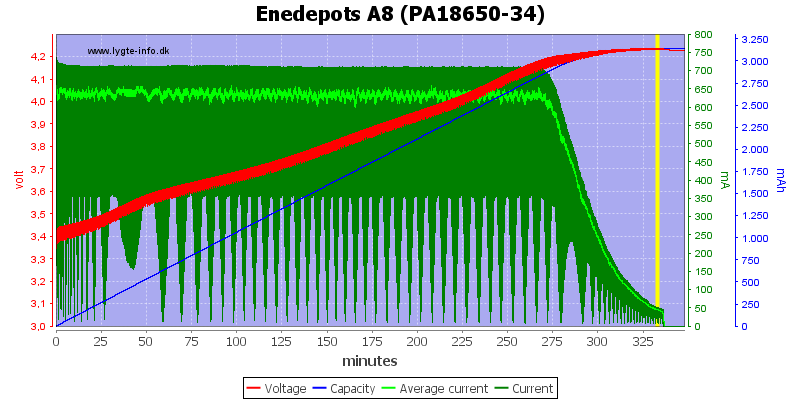 Discharge battery with less than 0.25mA (NiMH is less than 0.05mA) when power is disconnected. 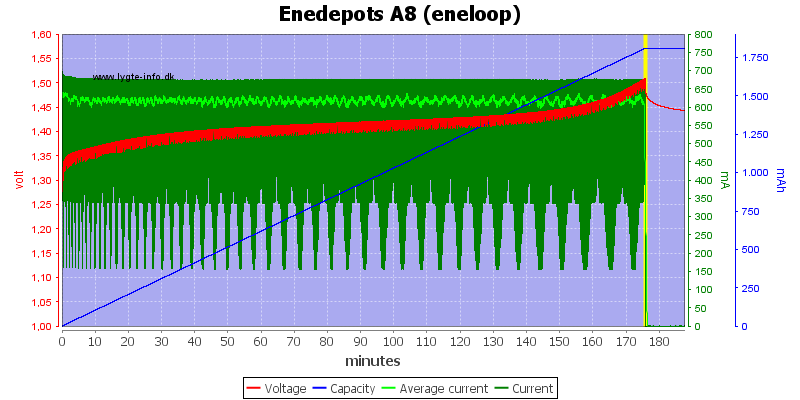 Charge battery with 0.1mA (NiMH: 0.4mA) with full battery when power is connected. Will not restart charging if battery voltage drops. 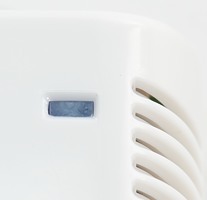 The charge will restart when a battery is inserted or power is cycled. Below 0.72 volt the charger will report error (all 3 yellow leds are flashing), a small current will flow (about 500uA), this is enough to reset a LiIon protection circuit, but the charger will not start charging (i.e. the batteries must be removed and put in again). Between 0.72 volt and 2 volt a battery is assumed to be NiMH. 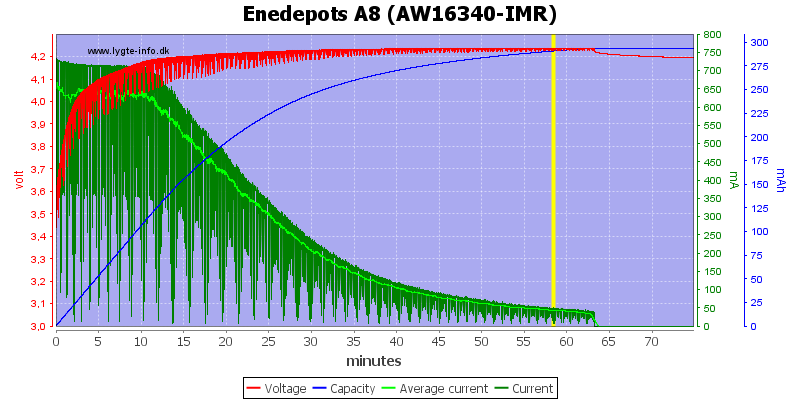 The charge curve shows a very good simulated CC/CV charge curve, the termination current is perfect for many 18650 at about 40 mA and very useable for smaller batteries. The charge time is 5½ hours. My old 16340 IMR cell. 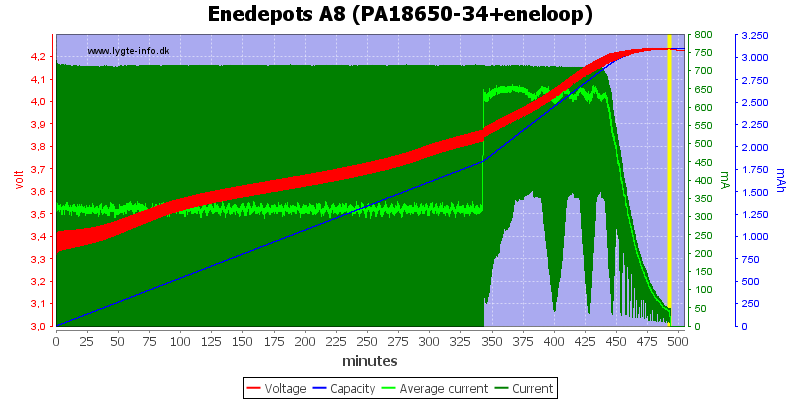 Due to the high impedance of the old cell, the charger goes into CV phase nearly immediately. 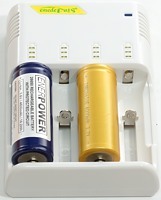 With the switch in the 3.2 volt position, the charger can be used for LiFePO4 batteries, this does also work as expected. All four slots at the same time. 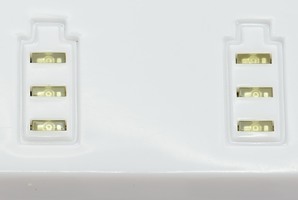 The charge time is longer because the two charge channels need to share current between the four slots. The charge time is more than 10 hours. Doing the same with a 115 VAC 50Hz supply does also work perfect. The full charge curve does not show how the charge current looks. For this a oscilloscope trace is needed, it shows a pulsing current. 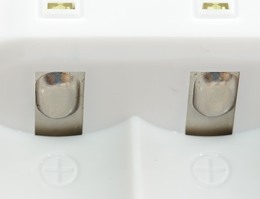 The charging circuits stops every two second to check the other slot. The charging current is off 10% of the time. 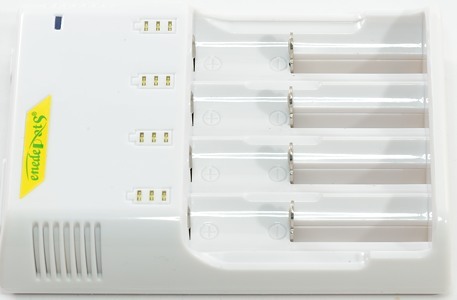 With a LiIon in two slots, shared by the same charging channel, the charging is two seconds for each slot. The charger needs about 3.5 seconds from power is applied until it starts charging. 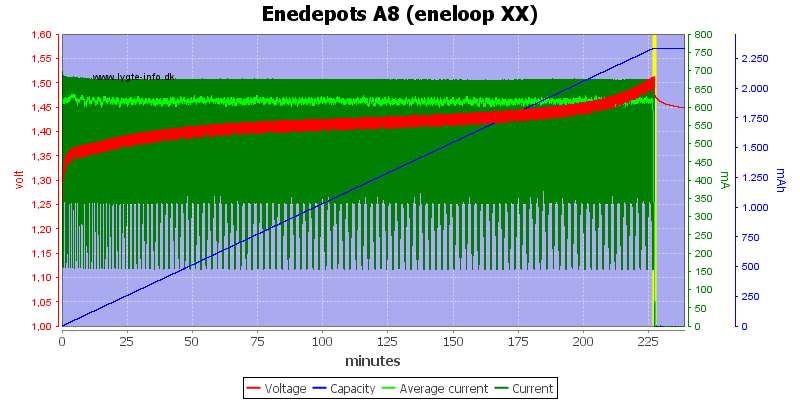 For testing I uses eneloop AA cells, these are a very good quality NiMH batteries with about 1950 mAh in capacity from new. 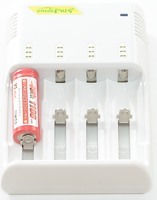 The NiMH AA cell does charge with a constant current until the charger terminates. But the termination is not a -dv/dt terminations. The charge time is about 3 hours. A higher capacity cell takes, of course, longer to charge. 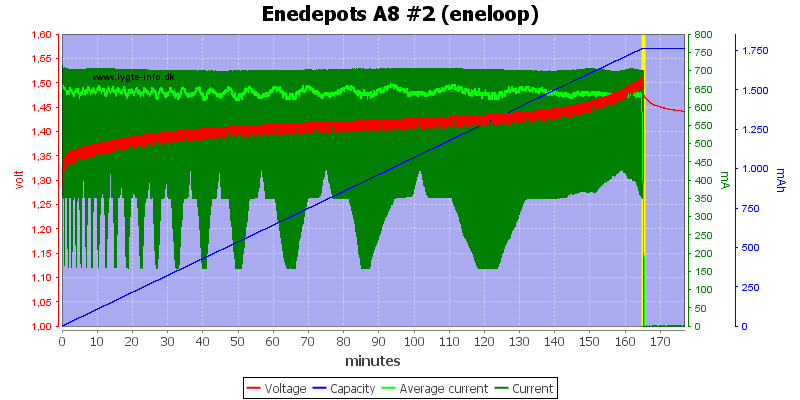 With 4 eneloop the charge current goes down, but everything else works as before. The charge time is about 5½ hours. Charging is with pulsing current (Exactly like LiIon). 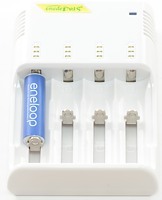 With a eneloop in all slots, the charging is two seconds for each slot. The startup is the same as LiIon. 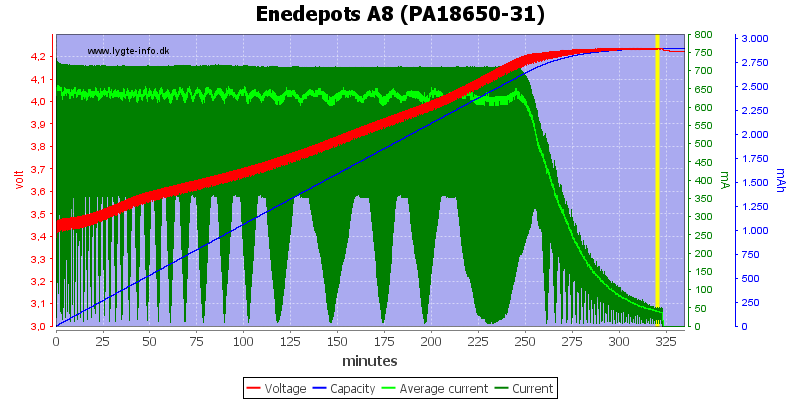 If the charger is started with a full NiMH it only takes about 30 seconds to detect it and stop charging. 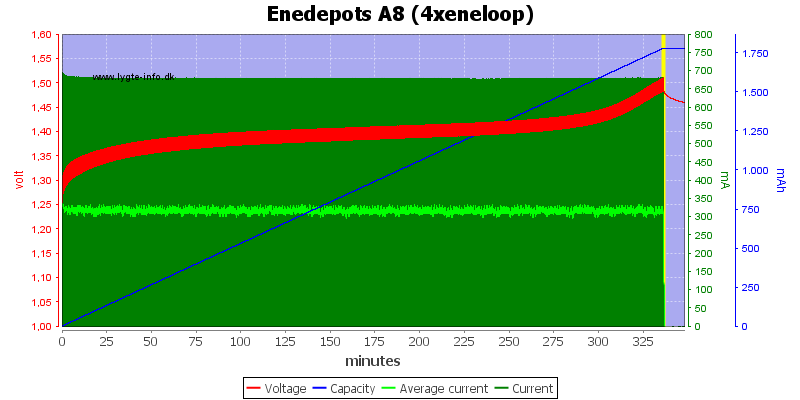 First charge curve is measured on a LiIon with a NiMH in the other slot. 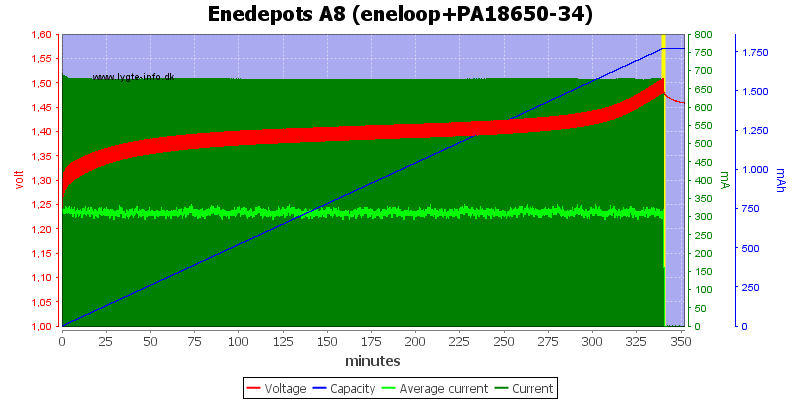 This works perfectly, after 5½ hours the eneloop is finished and the LiIon battery gets the full charge current, until it is full after 8 hours. 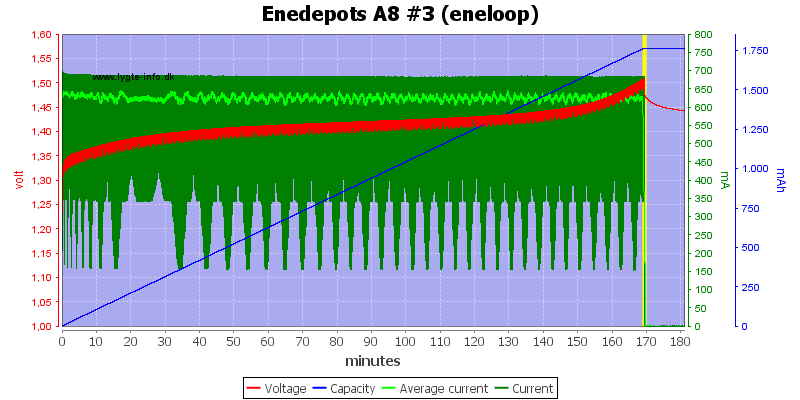 This curve is measured on a eneloop with a LiIon in the other slot. 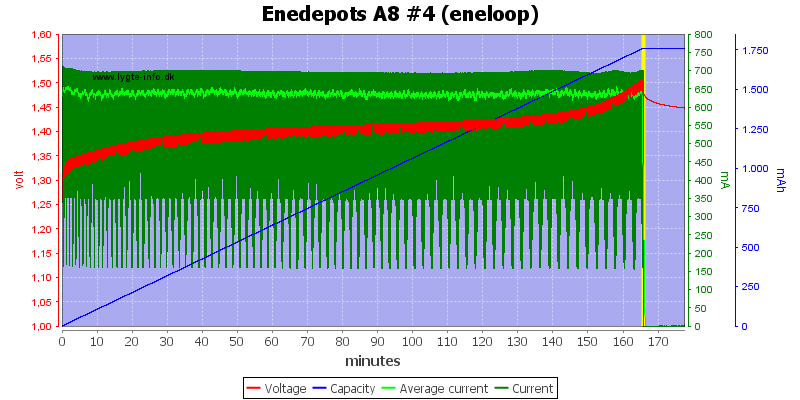 This looks exactly like the 4xeneloop chart. The charger passed a isolation test with 2500 volt, but failed a 5000 volt test, this makes the charger acceptable for 110VAC useage, but doubtful for 230VAC usage. Usage with 12 volt (in a car) is, of course, always possible and safe. A short list of the good and the bad things with the charger. I uses ++ for the really good things. things. 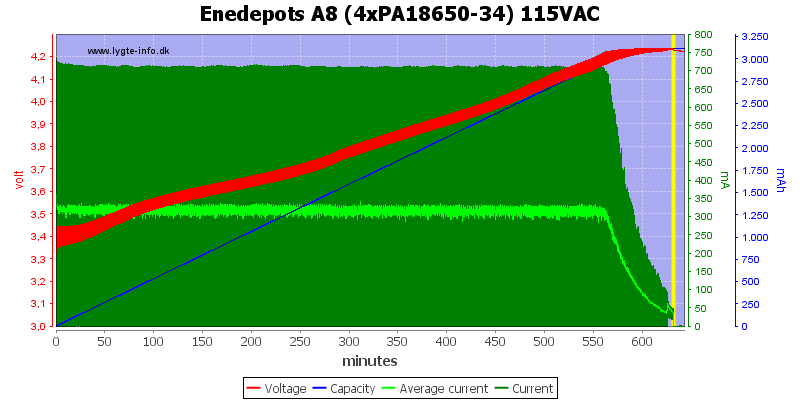 ++ The charger uses a (simulated) CC/CV algorithm. ++ The slots are long enough, all protected 18650 will fit. + The charger can be used on 12 volt. + Good indicator lights with estimation of charge in cells. + Can reset a LiIon protection circuit. + The slider has good connection with anything from 16340 to 26650 cells. + The charger is universal voltage, i.e. it can work on both 110/115/220/230 VAC. - The charge current is too high for 10440 cells. - The NiMH charge mode prevents correct handling of over discharged LiIon (This is unavoidable in a multi chemistry charger with automatic selection). 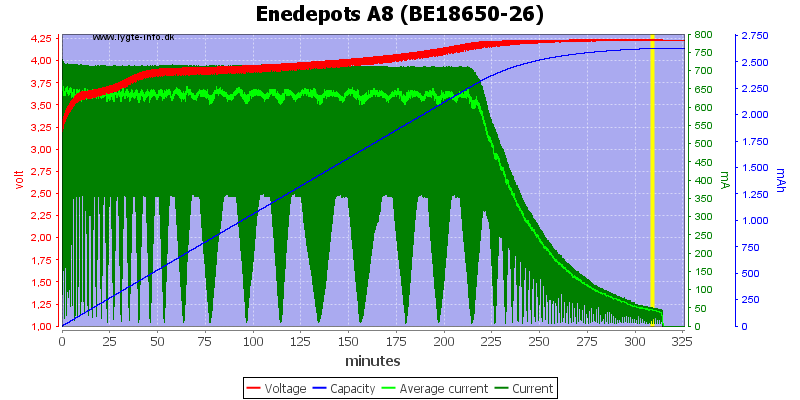 - The NiMH charging algorithm does not use -dv/dt termination. -- The slider does not move very smootly. 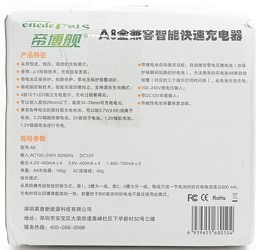 -- Electric safety when used on mains power is doubtful. This charger uses a CC/CV charging profile. The charge current is a good compromise for handling many battery sizes with only one current setting, but it will be hard on the smaller batteries. The charger also does a good job on NiMH batteries, but I wonder about the termination. 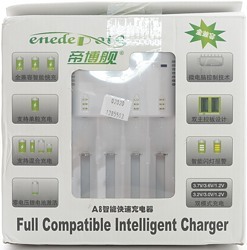 I will call it a good universal charger, but only for 12 VDC supply. 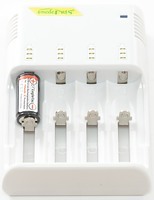 This charger is very similar to the Sysmax I4 charger, except for the addition of LiFePO4 capabilites. All tests are done at 230 VAC mains supply, except when otherwise specified. 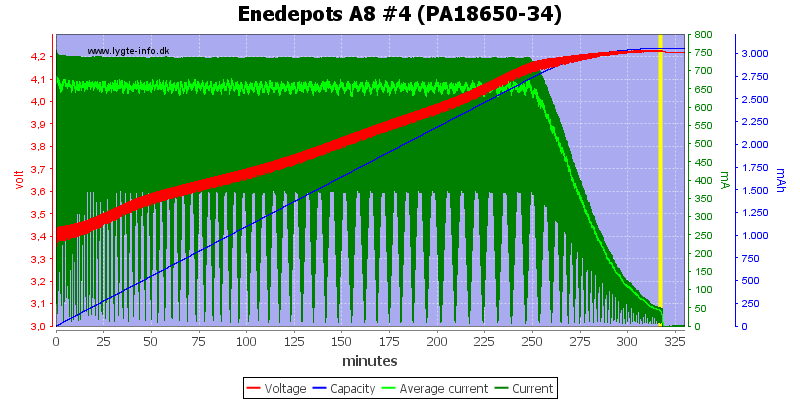 The patterens in the green current curves are due to interference and not any variations in the charge current.